A Salvadoran man looked at us and asked if we could make ends meet earning five dollars a day. I was with a group of students and we were in Arriaga, Chiapas, Mexico in a migrant shelter called “Hogar de la Misericordia” in January. The man, like most of the 15 other men talking to us in a semi-circle, had walked a grueling 150 miles from the Mexico-Guatemala boundary. 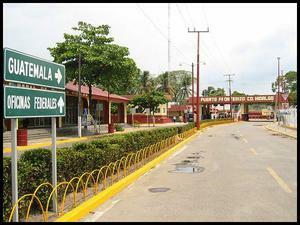 They had done so to circumvent the numerous immigration, military, and police checkpoints on the road leading north from Tapachula, a Mexican border city. The man paused to let the minimum wage in El Salvador sink in. The outside patio was silent, the only sound was the constant gusts of wind coming from an approaching storm off the Pacific coast. Then another young man piped in. He was also from El Salvador and had the face of a teenager, looking no older than 16. He said that he feared for his life. It was due to the gang violence, he stated, so constant in the aftermath of Central America’s bloody (often U.S.-sponsored) civil wars throughout the 1970s, 80s, and 90s. One of the more infamous gangs is the Mara Salvatrucha, or MS-13, formed in Los Angeles in the 1980s and spawned by the U.S. deportation machine and now, many say, ever more powerful in the context of Latin America’s interminable drug war. All these men had three days, if needed, to stay at the shelter. And they were there because only two blocks away were train tracks, the sending-off point of the freight train nicknamed “La Bestia,” where many undocumented Central Americans risk their lives to head north towards the United States. It has been also called the tren de la muerte (the train of death) or the tren de los desaparecidos (the train of the disappeared). According to the Movimiento Migrante Centroamericano (the Central American Migrant Movement), 70,000 Central American undocumented people have disappeared traveling through Mexico in the last 30 years. In September 2012, Assistant Secretary of International Affairs and Chief Diplomatic Officer for the U.S. Department of Homeland Security, Alan Bersin, asserted that "[t]he Guatemalan border with Chiapas is now our southern border." Statistics recently released by U.S. Customs and Border Protection help show why: according to DHS’s numbers, apprehensions of Central American migrants increased by 55 percent in 2013 over the previous year. This increase manifests a larger shift: After many years of arrest numbers going down, Border Patrol apprehensions have been on the rise again for the last few years. The 414,397 arrested in 2013 was a jump from the 356,873 in 2012. All this indicates an exodus coming primarily from Honduras, Guatemala, and El Salvador. The migrants are finding new routes as they try to avoid the U.S. apparatus of exclusion—which explains why, for the first time in a decade, there have been more arrests in Texas, specifically the Rio Grande Valley, than in Arizona. But the faces of the men in the shelter spoke to a story of a border crossing that had already begun, that begins thousands of miles before even reaching Texas. The borderlands of the United States, as Alan Bersin suggests, are much larger than we typically imagine. Todd Miller has researched and written about U.S.-Mexican border issues for more than 10 years. He has worked on both sides of the border for BorderLinks in Tucson, Arizona, and Witness for Peace in Oaxaca, Mexico. He now writes on border and immigration issues for NACLA Report on the Americas and its blog Border Wars, among other places. His forthcoming book, Border Patrol Nation Dispatches from the Front Lines of Homeland Security, will be published by City Light's Open Media Series in the Spring of 2014.